Attractive nautical brass binocular.Used to view distant objects using binocular vision. We offer high quality nautical reproduction handicrafts such as nautical binoculars. New Beautiful style Functional Brass weighing scale with a wooden Base box and complete set of weights. starting from 1 mg to 10 grams. Great for decoration and weighing small items like jewelry and gemstones. The scale measures 5.5 inch in height and scale width is 4.5". We specialize in providing excellent quality Brass Binoculars for birders, hunters and other outdoor enthusiasts. Our range of Brass Binoculars feature unique lenses to provide a wide-field of view that is greater than normally seen through binoculars of the same magnification. We also provide waterproof binoculars, which are literally submersible. Finishing:- Polish With Brown Leather SheathedBrass Leather Sheathed Binocular have a focusing arrangement which changes the distance between Binocular and objective lens. It is made of solid brass. One of the main item in our range of brass Binoculars. Our clients can avail from us a special range of brass Binocular that are amongst our highest selling products in the market. Conceptualized and manufactured by a team of experienced professionals, these Binoculars are provided with or without leather case. This is a full brass polished binocular. Antique Brass Binoculars With Tripod 6"
We also provide 6 inch antique binoculars with tripod with tripod measures 6. 5 inch x 5. 5 x 16. 25. The magnification is 4x. Classic campaign glasses used by victorian gentry and army and navy to observe while able to take notes and sketch. Sturdy 19th c. Binoculars on elegant beautifully crafted mini tripod. Available in brass finish, antique finish, nickle chrome plated etc. 4" binocular , slow motion, shiny brass finish. 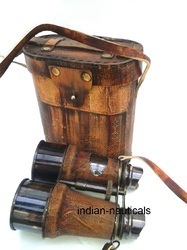 We offer a wide range of nautical binocular in antique patina that is manufactured from top quality raw materials. These are known for their fine finishes and antique designs. Widely used as gift items these binoculars can also be used as enhancing the home decor. We offer these binoculars in the size of 6 inches and at most competitive prices. We are the leading manufacturer and supplier of Brass Antique Nautical Binocular (Frog Style). It is made of solid iron. It is a beautiful gift for collector. 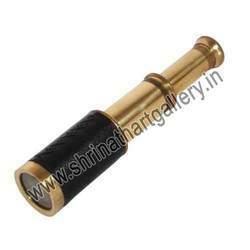 Fine binocular made by brass. We are wholesaler & exporter of camping handicraft. We are the leading supplier and trader of 10×25 Mini Porro UCF Binoculars is designed for extreme portability and rugged performance with small packages. It provides 10x magnification with 25mm objective lens. Nice binocular made from brass material. Fine binocular with leather made by brass. We are wholesaler & exporter of Camping Handicraft. We are the manufacturer of binocular. We have lot of binoculars. Made of brass, this binocular has adjustable center fit screws.